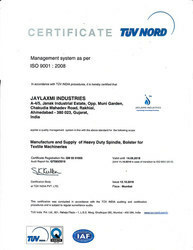 Jaylaxmi Industries, began its operations in the year 2001, as a prominent manufacturer, supplier and exporter of a highly commendable range of Spindle and Greasing Machines. The offered array includes Ring Twisting Heavy Duty Spindle, Ring Spinning Spindles and Spindles with Special Spinning Head. Offered assortments are designed and manufactured by using top quality component under the supervision of our talented experts as per the industry defined norms and standards. Apart from this, we are offering these products at the affordable price range to our customers. We have constructed a state of art infrastructure unit at our end over a large area of land that is equipped with all the useful modern machines and equipment, which helped to achieve the firm's targets. Further, our high patron-centric approach has helped us in gaining a huge client base across the globe. Moreover, to satisfy our customers in an efficient manner, we are manufacturing the offered products in various types to choose from. Additionally, we export our products in Canada, Bangladesh, Turkey, South Africa, Australia, Italy, and Gulf Countries. Under the effective management of our Mentor, Mr. Chandan Singh, we have witnessed these heights of success in the past years of our existence in this domain. Just because of his valuable assistance and sharp business skills, we have been able to build a long-term relationship with our prestigious clients. Manufacturing, Trading, Importer and Exporter of HDPE Packaging Bag And Tarpaulin. We have designed and developed an ultra modern infrastructure over a vast area in our premise. Our infrastructure is equipped with all the required modern machines and tools. For an increasing production rate, we have segmented our facility into various functional units. We regularly check and upgrade the installed machines to attain high production with optimum quality. These work processes are supervised by our dedicated and knowledgeable professionals. To offer a quality assured range of spindle and greasing machines to our valued clients, we are manufacturing our offered products using high-quality components. Further, these are inspected on numerous quality parameters by our skilled quality experts each and every level of manufacturing. Owing to our quality centric approach, we are able to develop a huge clientele across the market. 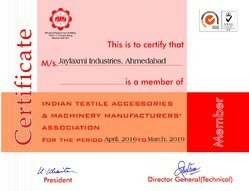 We always try to offer best quality product range for our valuable customers. Our team of qualified professionals is a key of our success in this domain. In addition to this, we provide regular training to them, in order to keep aware with the modern market concepts. With the help of our well qualified professionals, we are offering best quality products for our valuable clients. We are one of the trusted manufacturers, suppliers and exporters of a commendable range of spindle and greasing machines. All our products are available in different specifications to choose from. Moreover, we are offering different payment options to our clients for their convenient.